Accounting records are the records of a firm's financial transactions and current financial position. Accounting records are necessary for tax purposes, legal accountability and adequate financial oversight. The first thing to know is that accounting records come in two flavors: single-entry and double-entry. 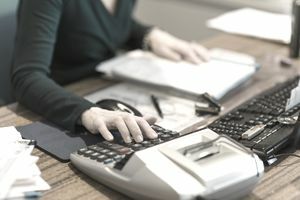 Each has its advantages; single-entry bookkeeping is simpler, as you might expect, and may be the appropriate system for a small business owner. Double-entry bookkeeping -- again, no surprise -- provides two journal entries for every transaction, a debit entry, and a credit entry. This is more complicated, but because these two entries must finally balance (hence:"balancing the books"), it gives you a way of catching errors and also makes frauds easier to catch. Double-entry bookkeeping is the usual standard. The financial statement. At this point, your hard work pays off. You now have a document that lenders, government agencies -- any entity that wants to know who you are financially before doing business with you -- will accept. This is the briefest outline of the accounting process, from its beginnings in transactions to the production of the financial statement. You'll need to know more before beginning your own accounting system, but you now know where you're headed. If you're doing this yourself, and particularly if you decide on the more ambitious double-entry method, invest in a basic book or two on the subject. "The Accounting Game: Basic Accounting Fresh from the Lemonade Stand," for instance makes the learning process a little less tedious by basing the instruction on the running of a lemonade stand. It's available on Amazon. Another approach is to begin with a system like Quickbooks, which provides a clear and popular method of doing double-entry accounting along with clear instructions on how to use the Quickbooks accounting system.